Raul Mateo Magdaleno, serves as the Chief Education Officer for IDQ Group, providing innovative education strategies to corporations, non-profit, government agencies, universities and school districts who are committed to reducing the dropout rate and increasing college enrollment among urban students. Magdaleno is also the Founder and Chairman of The Magdaleno Leadership Institute, a non-profit organization devoted to building high school student servant leaders and position them to become the next ‘Navy Seals’ of community empowerment. Most recently, Magdaleno was appointed by the U.S. Senate Majority Leader and confirmed by Congress, to serve a four-year term on the U.S. Congressional National Board of Directors, Congress’s highest award for youth. Prior to becoming the CEO, Magdaleno served as Special Assistant to the Dean and created the department of Diversity and Community Engagement for Southern Methodist University (SMU) Meadows School of the Arts. As Director he was instrumental in building community relationships and founded Texas’ first Hispanic Youth Institute at SMU. In addition to Magdaleno professional career, he has dedicated his life to public service, which began at age thirteen, where he served in various leadership capacities at Reconciliation Outreach (RO) accumulating over 30,000 hours of community service. As a result of his tireless dedication and commitment to his community, he earned the U.S. Congressional Award Gold Medal, the highest civilian award given by the United States Congress. In 2001 he was the youngest member of the RO Board of Directors, and collectively helped found “The Refuge,” a shelter for battered women and children. Since its inception RO has raised over $5.8 million in assets, making it one of the largest privately funded non-profits in the Greater Dallas area with its creation of a low-income housing, elementary school, community soup kitchen, a single woman and men homeless shelter, a Children’s and Youth Recreation Center, and a multi-story non-profit leasing center. As a result of Magdaleno’s exemplary community urban development initiatives and inspirational story he was inducted into the Hispanic Scholarship Fund Alumni Hall of Fame and was recently awarded the SMU Cooper Peace and Justice Fellowship Award. In 2010 he was voted the National Latino Lider of the Year and awarded $25,000 by MillerCoors, in the same year Dallas voted and named him the 2010 One Man Dallas. To date Raul has spoken to millions of people across the country as a champion for higher education and has been featured as a special guest on CNN, Univision Don Francisco Presenta Show and NBC among many other broadcasts and print publications. Magdaleno professional leadership affiliations include: National Speaker for the Congressional Hispanic Caucus Institute; Board of Directors for Educate Dallas; Chairman of the Dallas Red Light Enforcement Commission; Former Texas Chairman of the Hispanic Youth Institute; Former Chairman of the Greater Dallas Hispanic, Asian, Black and LGBT Chamber of Commerce Annual Project; Dallas Independent School District Superintendent Advisory Board and Board Vice-President for Reconciliation Academy. 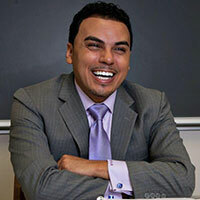 Raul earned a bachelor’s degree in corporate communication and public affairs from Southern Methodist University in 2006 and is currently working on academic research in hope to be a viable candidate for the Doctorate of Education Leadership Ed.,L.D.) at the Harvard Graduate School of Education. In addition, he is the proud caregiver of his elderly mother, Maria and in the process of adopting his older sister, Sylvia Magdaleno, who is gifted with down syndrome. Furthermore, Magdaleno is currently working with Reconciliation Outreach on creating a safe house for homeless college students, to be completed by Spring 2018.
next post: Waldo Mcmillan, Jr.